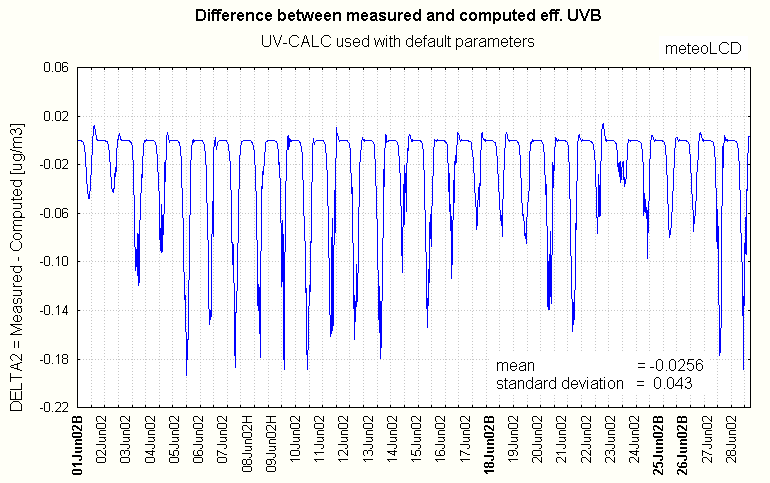 A comparison is made between effective UVB irradiance computed by the UV_CALC software from YES and the UVB irradiance measured by a Solar Light broadband UVB biometer. A good agreement can be found under blue sky conditions, when the tropospheric and total ozone data as well as the cloud cover percentage are taken into account; differences become great when sky is cloudy. Using the software with its default parameters gives much poorer results. For many years YES sells a software package called UV_CALC  to compute the effective UVB irradiance and the daily effective UVB dose; in this paper we use the MSDOS version 1.2 from 1991. 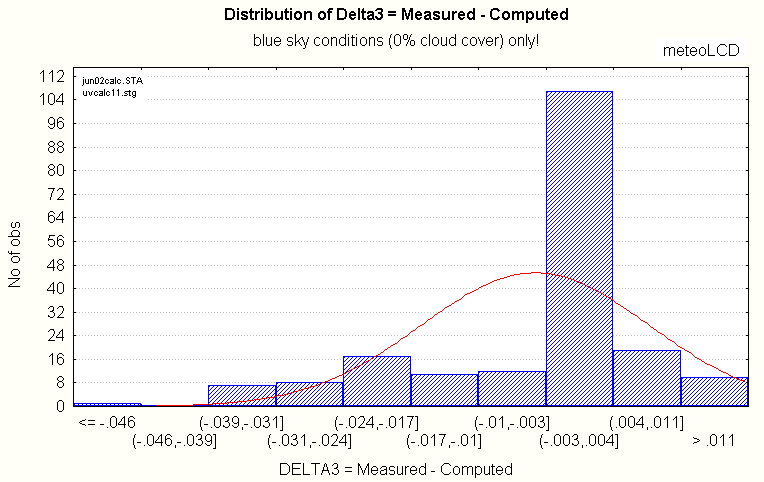 This software is based on Green's model  to compute the effective UVB irradiance on a given day, at a given location (longitude, latitude, altitude) and under specified atmospheric conditions: height ( and thicknesses) of tropospheric and stratospheric ozone layers, AOT and cloud cover. Despite its age and primitive user interface, the program is easy to use: a given run produces a graphical output of the eff. UVB irradiance over the day, and generates an ASCII file with the irradiances, the cumulutive dose and the various parameters used. A serious lack is the restriction to a single day-only run; the user who wishes to compute a whole month or extended period of time will have to repeat the program execution for every day, or do some programming to achieve this. 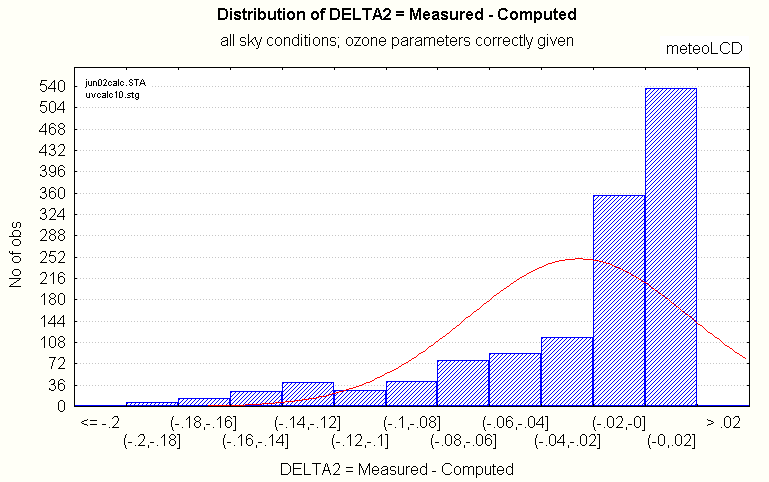 The default values for the low level ozone layer are 18 DU and 1.4 km AOT; they are 304 DU, 22.4 km and 0.0045 km AOT for the higher layer parameters. At meteoLCD (http://meteo.lcd.lu) both ground ozone concentration ( in ug/m3, altitude 215m asl) and total ozone column are measured; the AOT is measured only at the 1020 nm wavelength. A serious problem is that the software asks for a ground layer ozone thickness in DU, which can not be readily derived from our ground-based concentration measurements in ug/m3. We choose for this paper to divide the ug/m3 concentration by 4 to get an approximative DUlow thickness; this DUlow was substracted from our total ozone DU (measured by a Microtops II spectrophotometer) to give the DUhigh. All the other parameters (AOT's) were left unchanged, with the exception of the cloud cover. We introduced 3 cases: 0% for blue sky, 75% for a "many clouds" condition, and 95% for a "heavy clouds" condition. These conditions appear in the table of the DU data on the meteoLCD web-site. 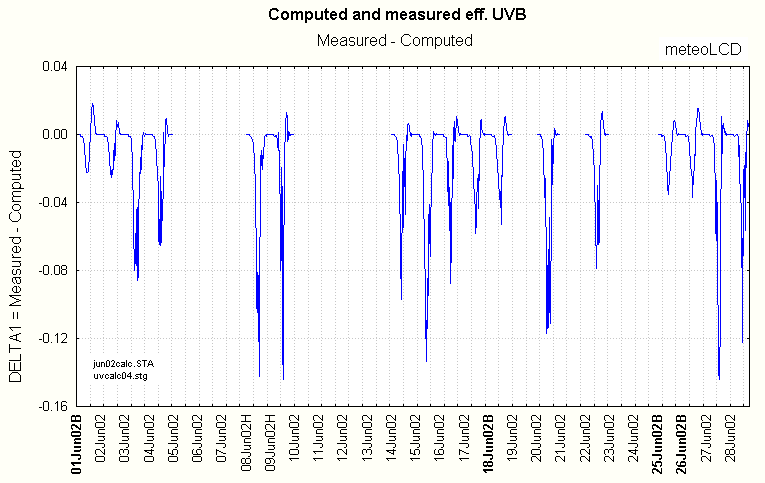 This comparion was made on data from the 01 to 28 June 2002 (1333 cases); the following graphs show the UVB irradiance during that period and the relation-ship between measured and computed data. Variations of computed and measured eff. 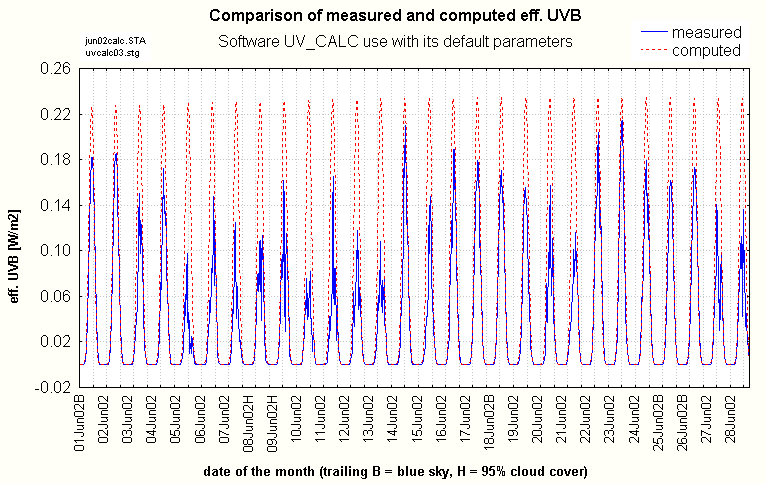 UVB irradiance from 1st to 28 June 2002; the days ending in B are blue sky days (0% cloud cover), those ending in H represent an approx. 95% cloud cover situation. As expected, the differences between the measured and computed data are in general smallest under blue sky conditions, and highest under 95% cloud cover. As said above, meteoLCD measures ground ozone concentration in ug/m3 as well as the thicknes of the total ozone column ( in DU). These parameters are entered into UV_CALC (taking 0.25*ground-ozone in ug/m3 as the thickness in DU of that lower layer), as well as the cloud cover ( 0%= blue sky, 15% = light haze, 75%=many clouds, 95%=heavy clouds). 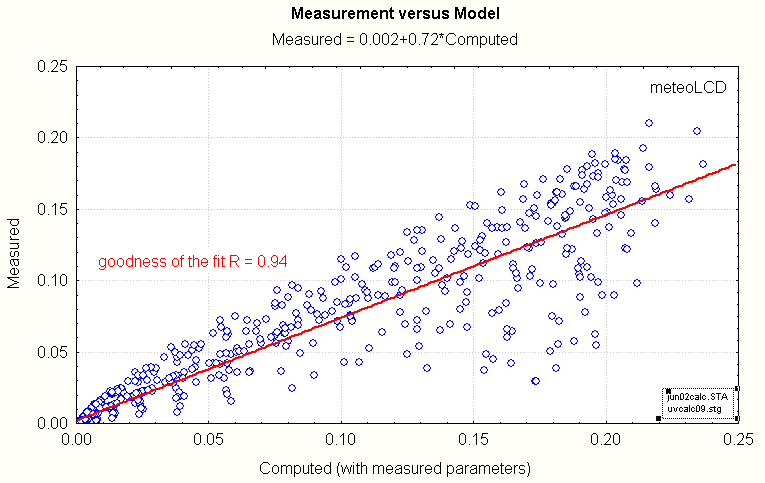 The statistical distribution of the differences between measured and computed data is highly left-skewed; the majority ( ~68%) of the differences are in the [-0.02; + 0.02] range. A conclusion from point 2 and 3 is that when using UV_CALC, one should use whenever possible, real data for the various parameters. This gives a much better result than simply applying the default "typical" parameters, even if the conversion of gound ozone concentration in ug/m3 to thickness of that layer use uin this paper is debatable. The linear fit gives a slope of 0.891; this is the multiplier to apply to the computed data to yield a "correct" result under blue sky conditions. In a personal communication  Prof. Gunther Seckmeyer told me that under blue sky conditions the influence of the exact ozone distribution (which was unknown) with altitude plays a minor role (max 3-4%); there remains the question how to represent in DU a ground-ozone concentration measured. The results show that the blue sky differences can be bettered if even a very raw estimate for the low layer ozone thickness is used. 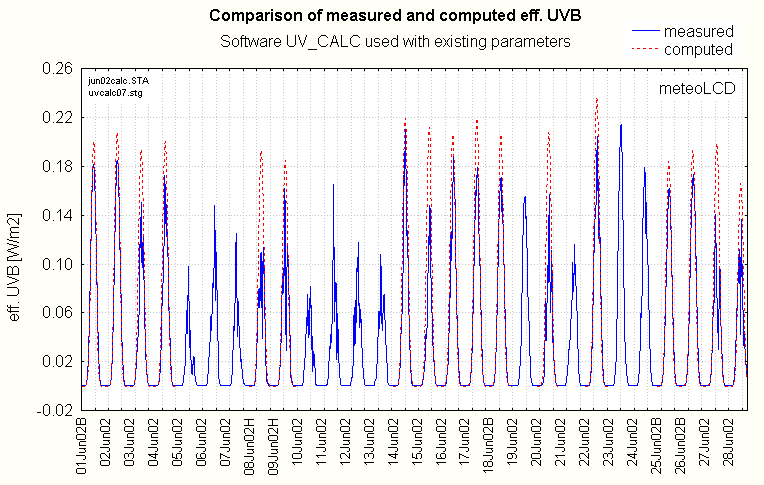 The UV_CALC software is a valuable tool to asset the working of a UV sensor measuring the eff. UVB irradiance, if the actual ozone conditions and cloud cover are at least approximately given as input parameters. 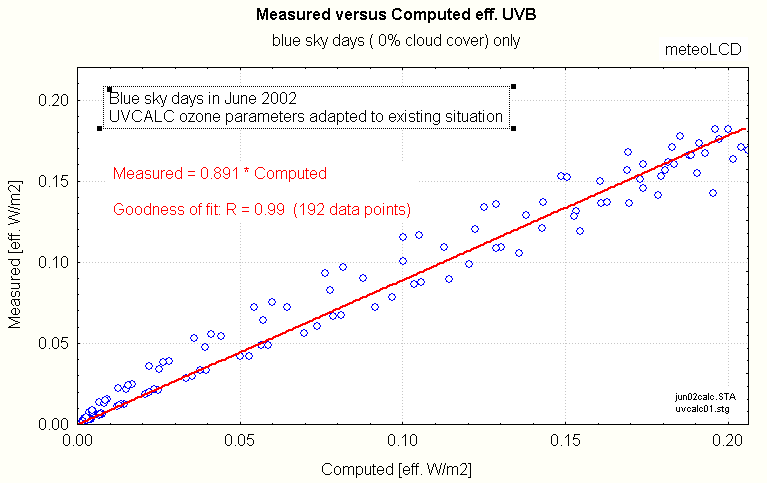 If feasible, one should limit the comparisons to blue sky ( 0% cloud cover) days. 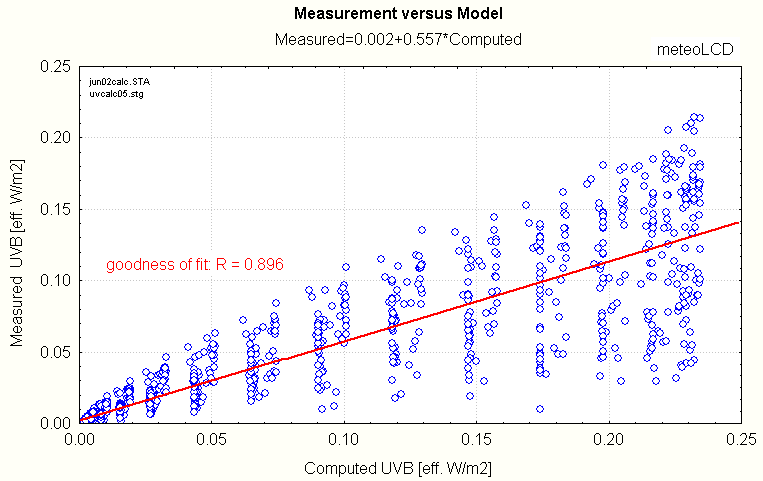 Computing a fit between measured and observed data gives a good multiplier which can be applied to fill the gaps in the measurement series in the case of a sensor breakdown; UV_CALC could also be useful to calibrate (with all the needed caveats!) a sensor with unknown specifications to correct eff. UVB . It should be noted that for this research, the AOT thicknesses were left to their default values of 1.4km for the lower layer and 0.0045km for the high layer; adjusting for the actual values might give a still better concordance. The UV_CALC software has no parameter concerning the precipitable water content of the atmosphere.